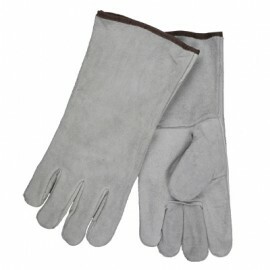 Stick welding requires a special set of skills and with it, a special set of gloves. 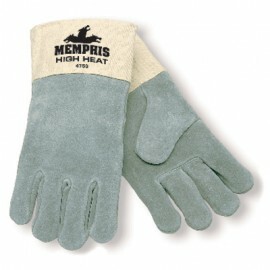 Tackle the toughest jobs with stick and arc welding gloves from trusted names like Memphis Glove, Revco and more. These handy accessories are designed with the specific rigors of arc welding processes in mind; this series of hand protection provides features like moisture and flame resistance to give you the most control while performing welding work. Durable materials, from leather to pigskin, keep these stick welding gloves strong for extended wear, while unique construction and stitching allows for unrestrained flexibility. 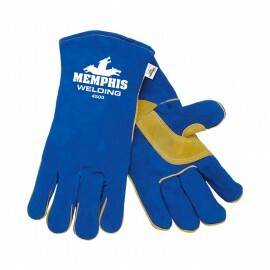 Stick a pair of these arc welding gloves in your arsenal and stay protected while on the job. At EnviroSafetyProducts, we understand how important it is for a welder to be able to protect his or her hands without compromising dexterity. That’s why we’ve packed our inventory with a huge selection of stick welding gloves at extremely affordable prices. You can get exactly what you’re looking for without breaking your budget. Please take a few moments to browse our extensive catalog, and if you have any questions about which welder’s gloves are right for you, call our customer service experts at 800-637-6606. According to the American Welding Society, the best stick welding gloves will be moisture-resistant, flame-resistant, electrically and thermally insulated, and flexible. At EnviroSafetyProducts, that’s what we believe, too – so our inventory is packed with welding gloves from the world’s most reputable manufacturers, like MCR and Revco. Many workplaces have welders on staff, like engineering and robotics plants, automotive shops and factories, on construction sites and in boatyards. If you employ welders, you’ll need to ensure their safety just like you do for the rest of your workers. 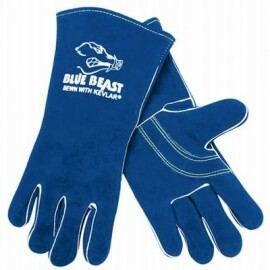 When you’re searching for the perfect welding gloves, you’ll need to look for comfort first. If you can’t move your fingers freely, you won’t be able to weld as well. Make sure your welding gloves are flexible and that they fit your hands. At EnviroSafetyProducts, our extensive inventory is full of welding gloves in a wide variety of styles, sizes and colors. 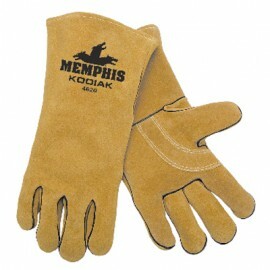 Some have premium-grain pigskin palms, cowhide shells and Kevlar stitching. Others have heat shields, cushioned linings and are heat-protective for temperatures up to 400 degrees. When you’re choosing welding gloves for your workplace, there are a few things to keep in mind. First, ask yourself how often they’ll be used. Are they for your own, personal use, or are they for your employees? 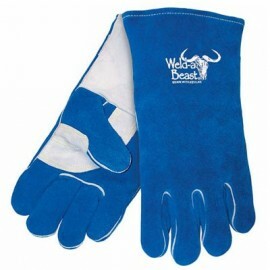 How many people will need their own pair of welding gloves? Will some people, such as those working different shifts, be sharing them? Once you know approximately how many pair of welding gloves you’ll need, evaluate the demands of your workplace. Additionally, consider your budget. Some welding gloves are extremely economical, while others represent a more long-term investment and may cost more (but just like anything else, higher cost doesn’t always mean higher quality). 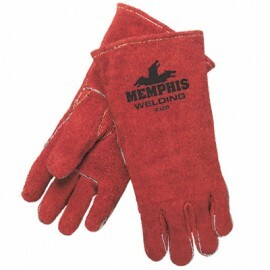 While welding gloves are a necessity, other personal protective equipment is just as important. Welders need top-quality welding helmets, welding glasses and welding jackets, bibs and aprons. At EnviroSafetyProducts, our main concern is providing the best safety gear at the most affordable prices. We’ll hold up our end by offering you access to our huge inventory of welding gloves and other welding supplies, and we’ll provide expert advice when you need it most. Just call 800-637-6606 to talk to our friendly, knowledgeable customer service representatives; they take part in comprehensive biweekly training, so they’re extremely familiar with all our welding gloves and welding accessories.